It is estimated that only 30,000 to 50,000 orangutans live in Borneo and Sumatra. 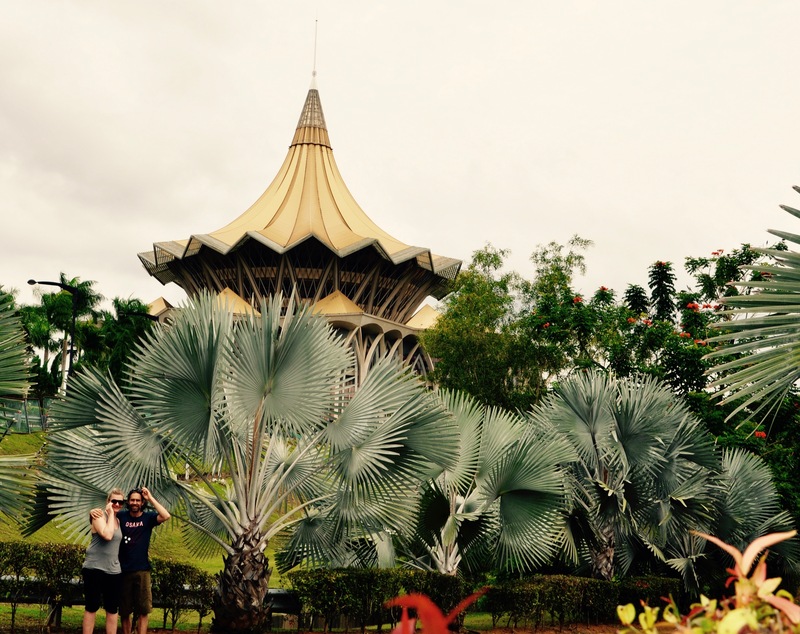 Kuching, the capital city of Sarawak (Malaysia, Borneo) is one good option to see them. There you can see semi-wild orangutans and their offspring in a natural environment. It is only a two hour flight from Kuala Lumpur and where I started my South East Asia journey. 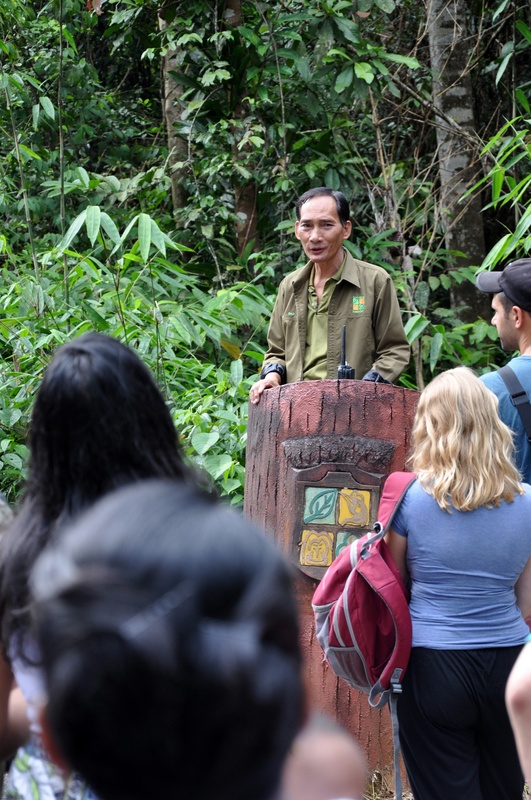 Upon arrival at the Nature Reserve or Wildlife Center Semenggoh, the visitors were given a safety briefing which started at 9am. The ten minute talk included some valuable information, be quiet and be calm because this could disturb the bigger males and lead to their aggressive behaviour. Do not eat or drink around the orangutans as this what they are coming to the feeding platform for and they might want to take your snacks. The warden also cleverly tossed in a guilt clause, “that people should be quiet for the benefit of other tourists who have travelled so far to see the orangutans.” I found the speech to be relevant, subtly prophetic, which created a sense of calm and empathy towards the orangutans, as well as the human primates. The orangs could be heard in the jungle calling shorty before the feeding platform was opened and the crowd of visitors “oooh and ahhs”. We were ready to see who or what was making the noise. The group of about 25 watched the warden feed the primates bananas, papaya, pineapple, coconut, sugar cane, sweet potato, milk and sometimes chicken eggs. Anuku an eleven year old male was waiting for the ranger to throw him bananas on the feeding platform. Five minutes later Mina a 29 year old female and her third off spring Jubilee, could be seen slowly swinging through the trees towards the platform. Once they neared the wooden platform area they used a series of ropes that have been installed for the apes to quickly swing down to the platform allowing them to move faster. 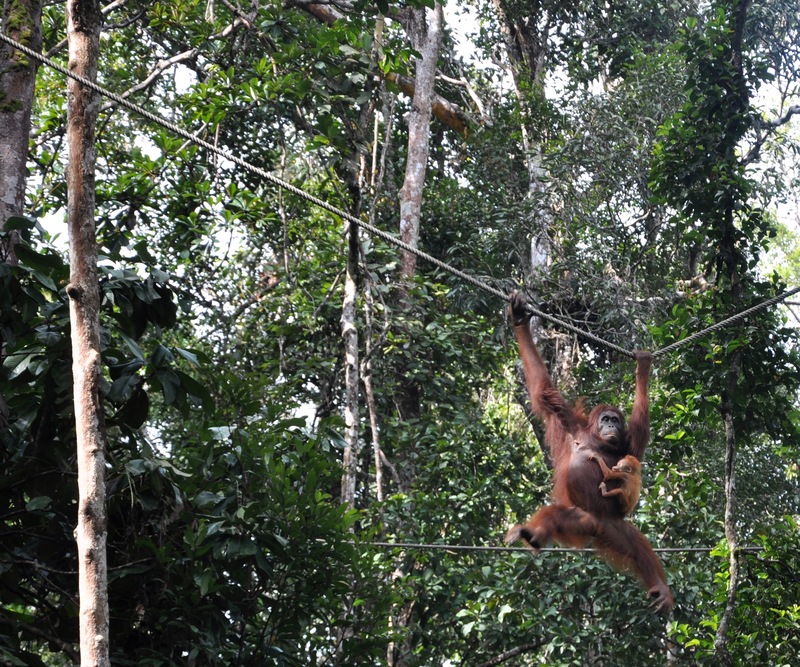 Orangutans generally only travel 200m to 3km a day via trees and vines above the jungle floor. 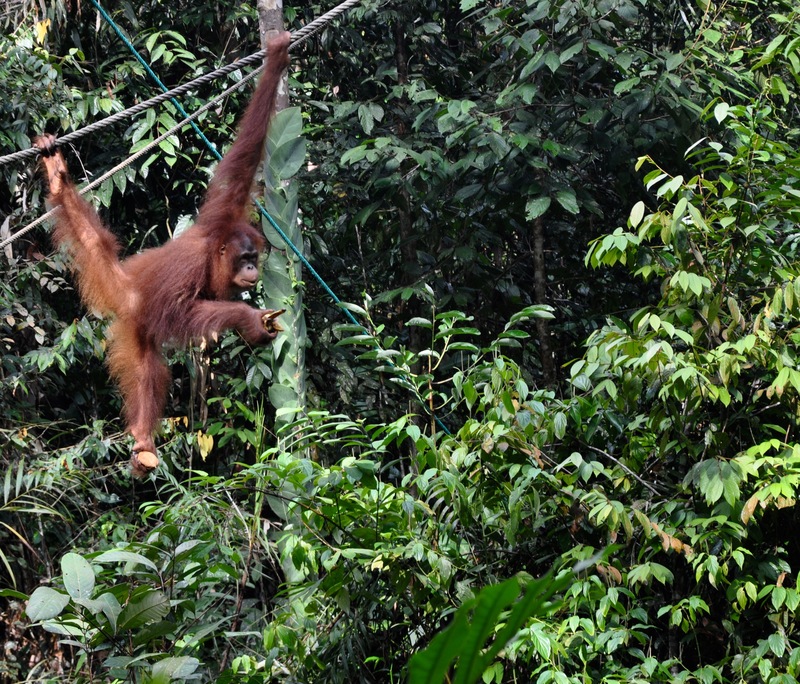 After eating sweet potatoes and bananas for about 20 minutes Mina and social Jubilee slowly climbed up the ropes and swung their way back into the forest. Ten minutes later Sabamiah came around behind the tourists viewing area which made everyone very hushed and excited. She had her young daughter, Ruby clinging to her and was only five meters away. They ate a few bunches of bananas and then quickly climbed back into the forest passing another orangutan laying in a nest that had not bothered to come down to the feeding platform for food. We waited for another few minutes to see if any other orangutans were around but at 10am none had come so we left but the experience provided big smiles. 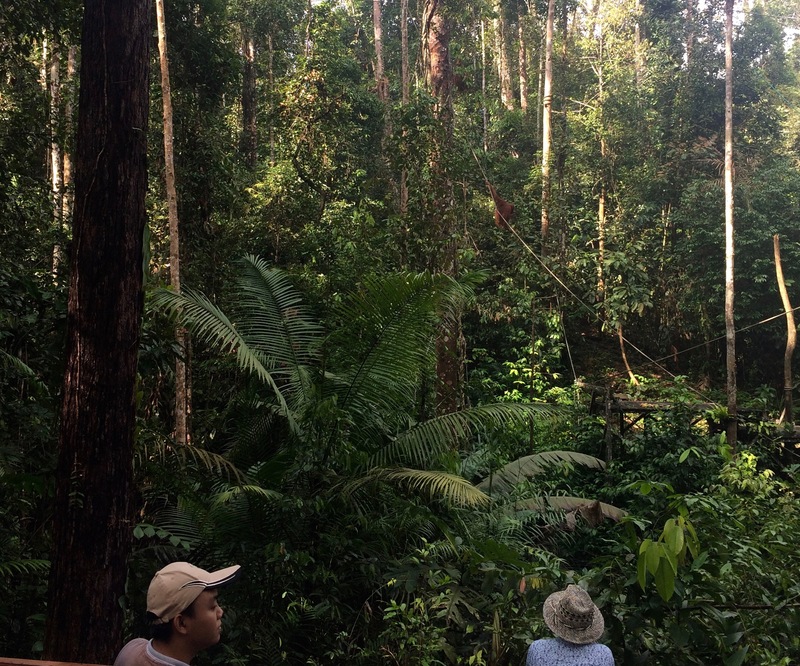 While in Borneo it has been mostly about the seeing what is left of the natural environment There were silvered leaf monkey, Long-tailed macaque and Proboscis monkey to be found at Bako National Park and Damai Peninsula. 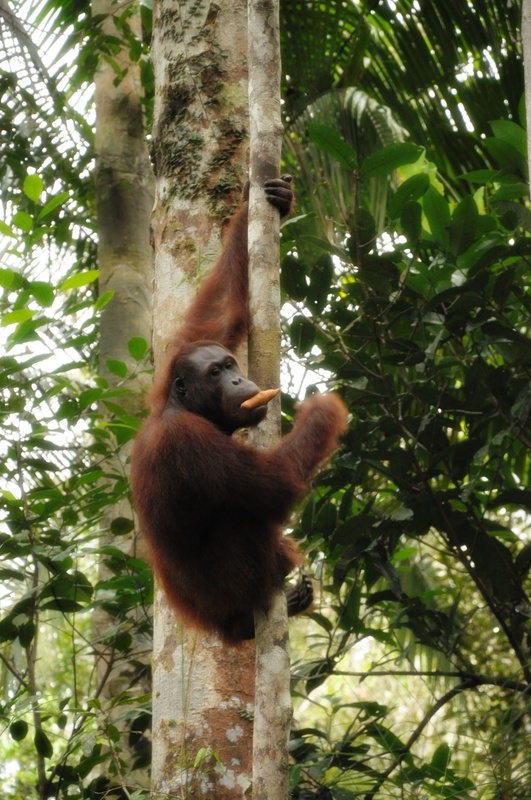 A second visited to Semenggoh Wildlife Center was a must because the orangutans were so fascinating. We saw Mina and Jubliee before we entered the feeding area path but young Jubilee was not very social, was whistling at mom that he wanted to go. 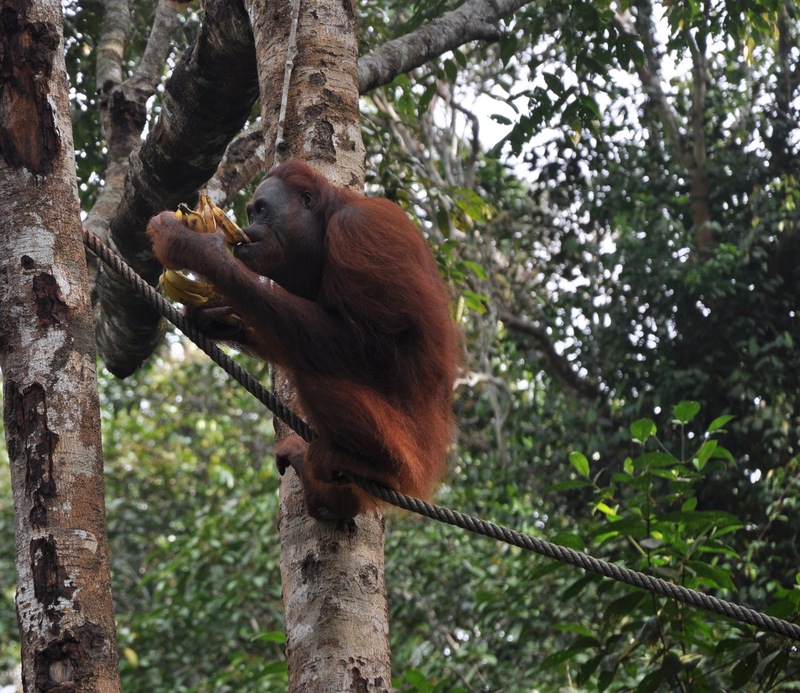 Mina was hungry because she gorged herself on bananas that the rangers set down by a tree. 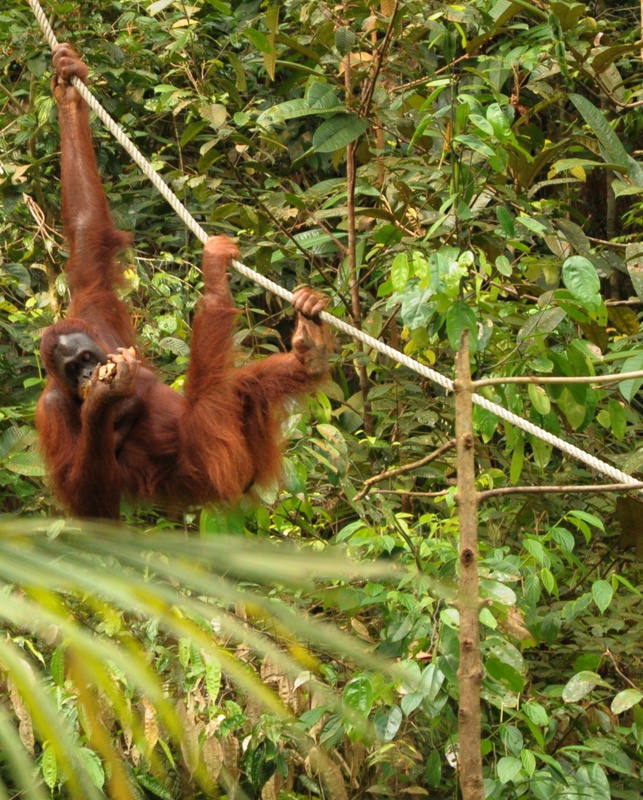 She ate for about ten minutes and climbed up the ropes slowly to follow Jubilee as he raced back into the jungle. Upon arrival to the feeding platform we saw sisters Endu, Selina and Selinas baby who is 4 month old male (the baby is unnamed). Selina grabbed a coconut off the platform with her foot and climbed ten meters up a rope with red haired baby clinging to her. She ripped the dried husk off the coconut with her teeth, moved it to her hand and swung her long powerful arm back. The coconut smacked against a tree trunk, she swung her arm back and forward again, a loud crack was heard and milk poured out of the coco. She opened it up and ate the meat. Endu swung around gracefully and seemed super flexible, strong and confident. Her food of choice was sweet potoato which she ate raw. She peeled the skin off first with her teeth and the had a second one. After twenty minutes of feeding the two orangutan and baby left the veiwing area. The red apes eat a diet of fruits, flowers, bark, vines, bird eggs, spiders, termites, ants, mushrooms and honey. 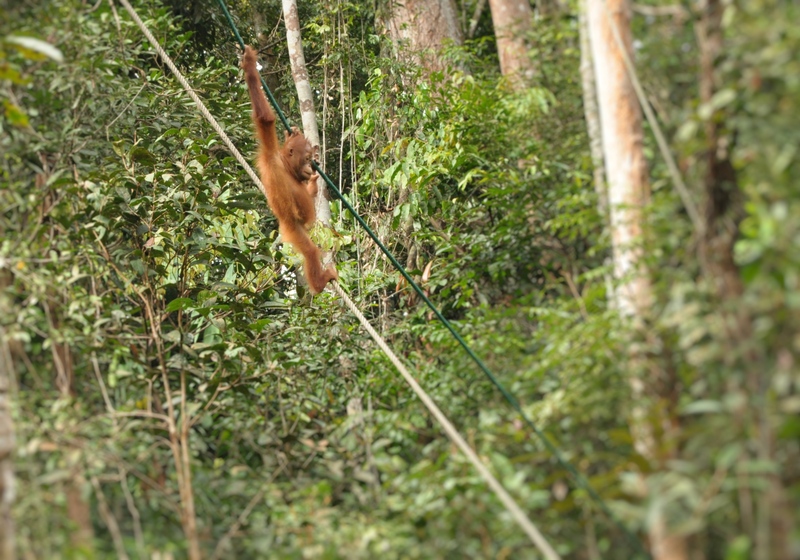 orangutans are 4 times stronger than humans with arms twice as long as their legs, which enables them to swing and climb in a very slow controlled fashion. 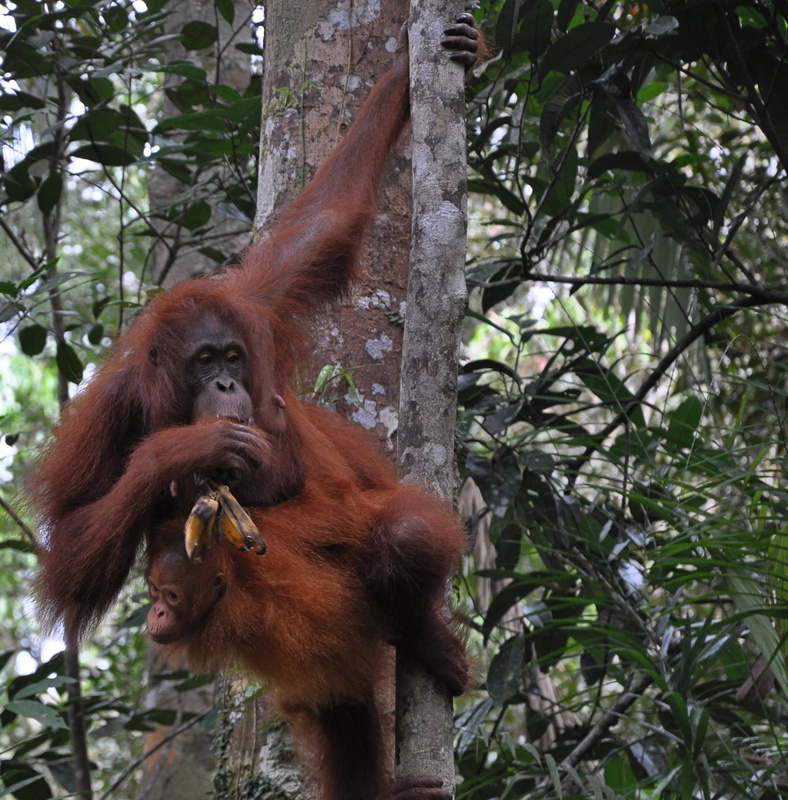 In the jungle they will feed for 2-3 hours in the morning then move, usually about 100m to 3km a day. At night they sleep in the trees, most of the time in a nest they have constructed. Kuching is a 2 hour flight from Kuala Lumpur on Borneo. Once in Kuching to get to Semenggoh Nature Reserve take bus K6 (City Public Link) from station 2 on Jalan Mosque in Kuching for 4 RM per person. It takes about an hour to get to the entrance of the park. Entrance fee is 10 RM per person. Feeding times are 9am-10am and 3pm-4pm, 7 days a week. 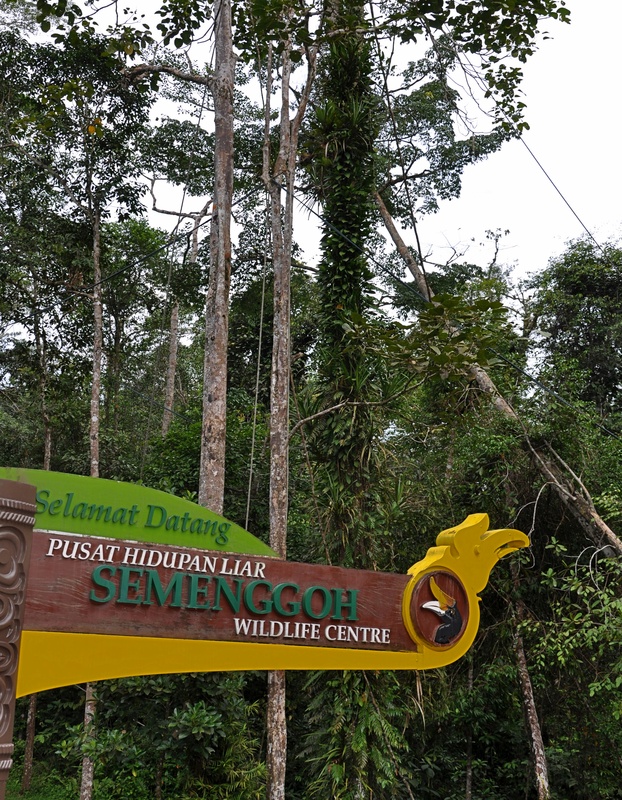 Semenggoh Nature Reserve. You can buy local breakfast on a little stand just 200m before the park – but you should eat it before or after visiting the orangutan as eating in the park could be dangerous to visitors but helpful for the apes. From the entrance it is about 15 minutes walking to the information center and feeding platforms.